Update 5/30/2014: here are the model equations and parameters. The interesting piece is that the trend towards a less-steep price level as the monetary base increases (a falling inflation rate, i.e. the effect seen in this graph) is already visible even in the fit to 1960-1970 (red) extrapolated to 1960-2014 -- that is, using the information transfer model, you could have seen the current "lowflation" environment in the US coming in the 1970s (amazingly, when inflation was at its peak). 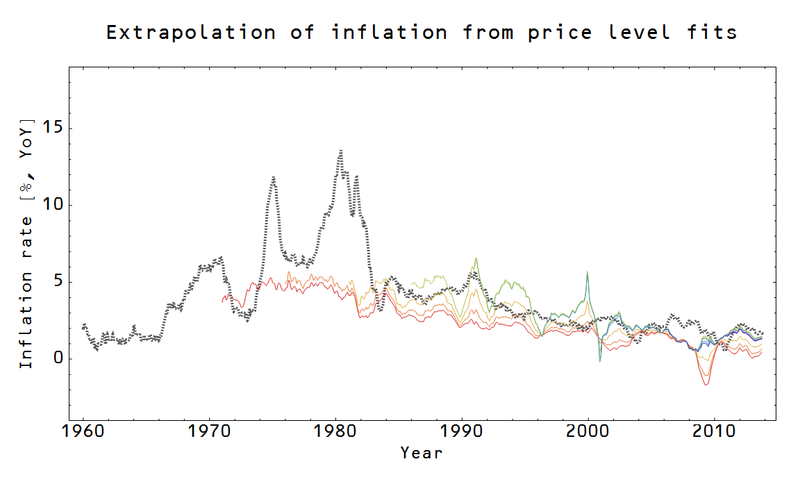 The red line is predicting low inflation in the 2000s just from 10 years of data in the 1960s (given the empirical path of the monetary base and NGDP). In fact, the issue that throws off the price level fits from that time and isn't predicted by the extrapolation are the two big spikes in inflation in the 1970s. We saw these before in this post on the 1970s -- attributed (at least in narrative form) to the oil shocks of the time, but could also be related to the "Fisher effect" and expected inflation. Let me caveat the use of the word "prediction" here. 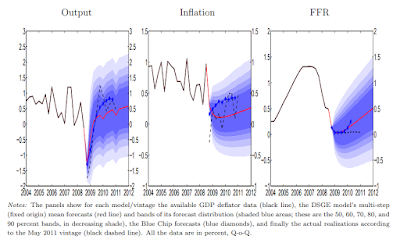 The model uses as input empirical values of the currency component of the monetary base ('M0') and NGDP in the extrapolations. 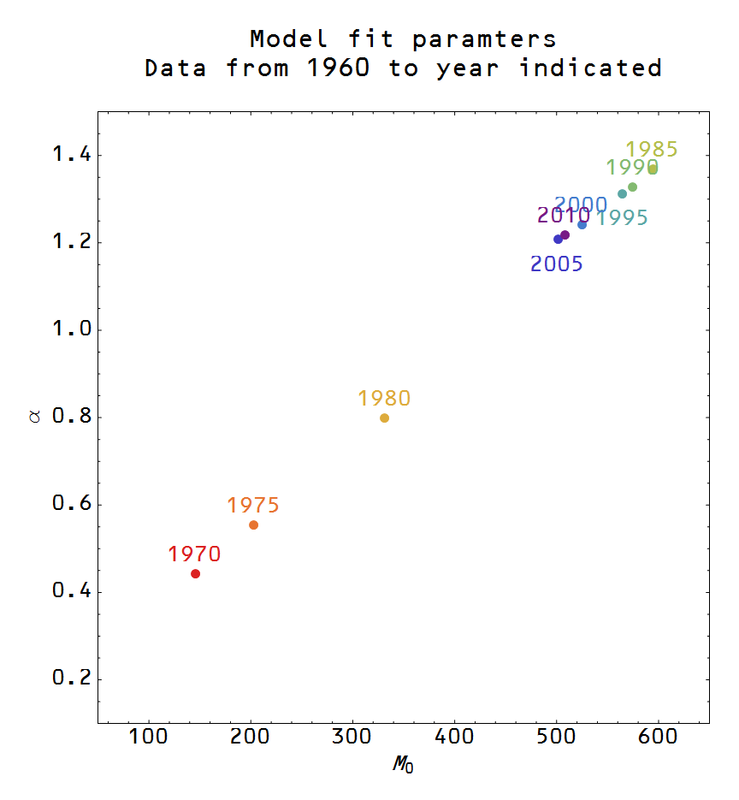 However, the model parameters are fixed in that original 10 years of data. In order to get the current inflation rate, you'd stick the current values of NGDP and M0 into the formula you would have had around since the 1970s (if it had existed at the time). That is, the model predicts a fixed relationship between P, M0 and NGDP and given any two values, fixes (i.e. "predicts") the third. This is extremely impressive, but is it useful? 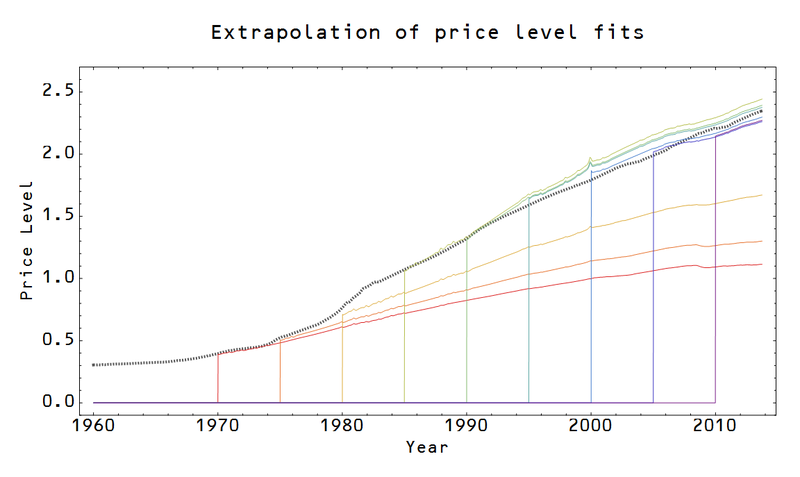 I find it very hard to predict the values of NGDP, M0 and P 40 years from now. You're telling me that it's enough to predict NGDP and M0 (or any other pair of them). But this is still very hard. Even with the ITM, it doesn't seem like a person living in 1970 could have predicted the current trends in NGDP, M0 and P. Do you disagree? That reduces the problem to just predicting NGDP or M0, which is still admittedly hard. The thing is that a person living in 1970 would not have had a strong reason to include the changing information transfer index (unless they had some really long run data). It is unlikely they would have come up with the model in the first place. As to the overall usefulness, I am not sure. Predicting the value of inflation within a 100 basis points 20 years from now even with a good estimate of future M0 won't have a huge impact on people's lives. People would care about prediciting recessions. Central banks seem interested in the shorter term, but overall I'd say it is an academic problem -- like predicting the orbits of planets. At least that is my interest in it.